We conduct economic and socio-cultural research to ensure that—in pursuit of our mission to preserve marine life—we consider all of the communities that depend on those resources. This can include fishermen, indigenous communities, whale watching operators, and other members of coastal communities that interact with marine resources in different ways. By studying both the social and economic aspects of communities, we can manage fisheries and protected species in a way that works best for everyone. Economic and socio-cultural analyses helps managers evaluate the benefits and costs of different activities, prioritize needs, and encourage policies that maximize societal benefits from ocean and coastal resources. We conduct research to evaluate the benefits and costs of alternative management actions for commercial fisheries, prioritize management needs, and design policies that sustainably maximize societal benefits from ocean and coastal resources. We collect economic data, develops economic models, and conducts analyses to maximize benefits to the nation while ensuring the long-term sustainability of all living marine resources. Resource managers consider the entire ecosystem, including humans and the natural elements, when making management decisions. By analyzing the economic and human dimensions of the marine ecosystem, resource managers are able to make informed decisions. We conduct research to better understand the impacts of management decisions on our nation’s vital fishing communities. Each region creates fishing community profiles, which contain social and economic data. Social indicators are used to help assess community resilience and vulnerability. We conduct a wide range of commercial fisheries economic analyses and related activities. This allows us to assess both the magnitude of fisheries management decisions, as well as the costs and benefits. This research supports our goal of maximizing benefits to the nation, while ensuring the long-term sustainability of all living marine resources. Economic performance of catch share programs. Market dynamics and consumer preferences. Capacity and technical efficiency measurement. Allocation of resources among user groups. The Fisheries Economics of the United States report is an annual report that summarizes economic information during a ten-year period related to commercial fishing activities and fishing-related industries in the United States. This includes information on commercial fisheries landings, revenue, and price trends. The value of U.S. commercial fisheries landings remains strong and has a broad positive impact on the U.S. economy. We conduct an annual survey of all seafood processors that operate in the United States. This is the only comprehensive survey of the U.S. seafood processing industry and is the source of all regional and national statistics describing this portion of the industry. The data from this survey is also used to calculate U.S. seafood consumption and the value of fish and fish products derived from commercial fishing. The survey also assesses the impacts of changes in fishery management plans and the impacts of natural disasters. Industry trade organizations and members of the industrial and financial communities use the data to make business decisions affecting the fishing and seafood industries. 6 resources match your filter criteria. To interpret the economic impacts of recreational fisheries and estimate the benefits of those fisheries, we collect economic data, develop economic models, and conduct analyses. This research also helps us understand and predict the behavior of those that participate in recreational fisheries and the possible effects different management actions might have on recreational fisheries. 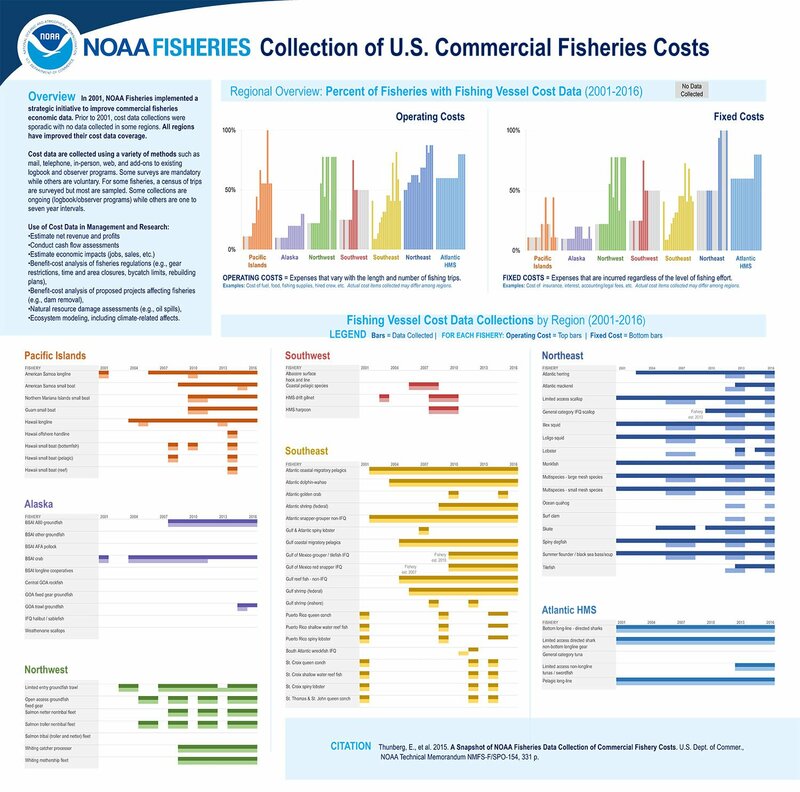 The Fisheries Economics of the United States report is an annual report that summarizes economic information over a ten-year period related to recreational fishing activities and fishing-related industries in the United States. This includes information on fishing trips, participation rates, and expenditures for the recreational sector. We conduct periodic nationwide surveys of marine anglers. Survey results assess how marine recreational fishing contributes to the economies of coastal communities and the nation. Resource managers consider the entire ecosystem, including humans and natural elements, when making management decisions. By analyzing critical fishery management issues like the economic performance of catch share programs, marine spatial management options, and protected species bycatch reduction strategies, we are able to provide resource managers with additional information to make informed decisions when managing marine ecosystems, thus, helping to ensure the sustainability of marine resources. Our protected species economic research includes protected species valuation studies, cost benefit analyses, and cost effectiveness analyses. Regulatory actions are required to have cost benefit analyses, and this research contributes to legislative and administrative mandates. We are currently focused on conducting protected species valuation studies. These studies allow us to assess the national benefits derived from threatened and endangered marine species, including fish, sea turtles, marine mammals, and sea birds. Economic values for protected species can be used to assess the benefits obtained from conservation and recovery efforts and provide a useful benchmark for valuing protected species research and recovery efforts. We have published values for eight different marine species using a multi-species valuation framework and are currently estimating values for an additional eight species. Habitat economics assess the benefits and costs of habitat recovery and restoration programs and measures the effects of habitat loss and degradation. Habitat economics also helps develop inventories of the values of a particular type of habitat, including the scope and scale of the benefits provided by a habitat. This information enables us to evaluate the costs and benefits as well as the cost effectiveness of future management options that may be considered for the purposes of protecting or restoring essential fish habitat. Marine protected areas conserve, manage, and protect a range of marine habitats in the United States and come in a variety of forms, including marine sanctuaries, estuarine research reserves, ocean parks, and marine wildlife refuges. They vary widely in purpose, legal authorities, agencies, management approaches, level of protection, and restrictions on human uses. We manage 87 percent of marine protected areas in U.S. waters, a total of 177. To make the best possible management decisions, we assess societal preferences for site locations and allowable uses and conduct integrated and predictive modeling of fishermen’s spatial choice behavior. Our economics program contributes to marine spatial decisions by predicting the values and trade-offs associated with fishery management options that restrict allowable uses in designated areas. Coastal and marine spatial planning addresses various ocean management challenges while considering economic development and conservation. Information on the benefits derived from current use patterns. A clear understanding of how users will respond to changes in use patterns. The benefits and trade-offs from changing allowable uses within an area. We are involved in a nationwide effort to profile fishing communities for the purpose of expanding our baseline knowledge of people who might be affected by changes in fishery regulations. Various federal statutes require agencies to examine the social and economic impacts of policies and regulations at the community level. We initiated a national effort to create and maintain a series of regional fishing community profiles. The community profile series portrays past and current engagement in fisheries and also contains basic information on the social and economic characteristics of these communities. These reports allow us to provide assessments of communities engaged in or dependent upon fishing for management actions. Social indicators are numerical measures that describe the well-being of individuals or communities. Indicators are comprised of one variable or several components combined into an index. They are used to describe and evaluate community well-being in terms of social, economic, and psychological welfare. Oral history interviews are a powerful way to document the human experience of our marine, coastal, and Great Lakes environments and our living marine resources. Visit our Voices from Fisheries database and listen to fascinating interviews from people who are part of the commercial, recreational, and subsistence fishing industries in the United States and its territories.